Poultry shears, kitchen shears or scissors – no matter your preferred name for these handy cutting devices, the fact is every kitchen should have a pair. 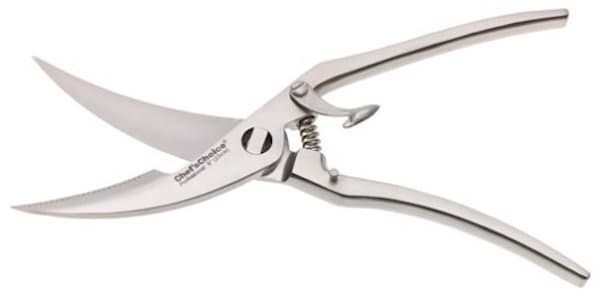 They are ideal when it comes to breaking down chickens, (hence the name poultry shears) but are also excellent for other tasks beyond preparing a bird for dinner. 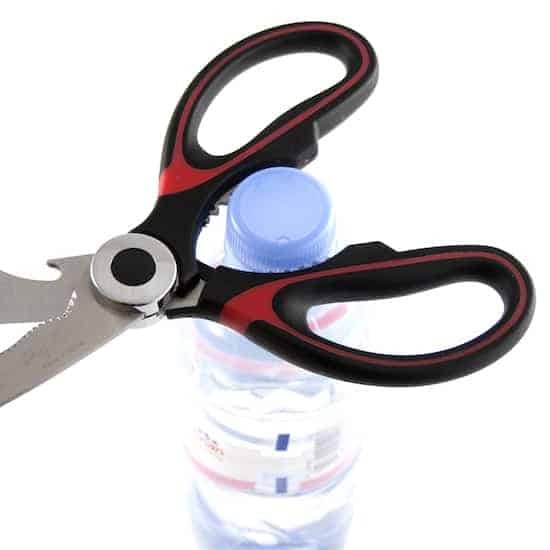 Whether you’re sniping twine or chopping the tips off of squirt bottles or simply opening up some vacuumed wrapped new toy, a strong set of kitchen scissors will get the work done. So what are the best kitchen shears you can buy in 2018? As always, we have done our research and come up with a top 5 list. Get the lowdown in our table below, and keep on reading for the in depth reviews and other helpful info. As we’ve already covered, a good, solid set of shears will work wonders in the kitchen. But what sets one pair of poultry shears above another? 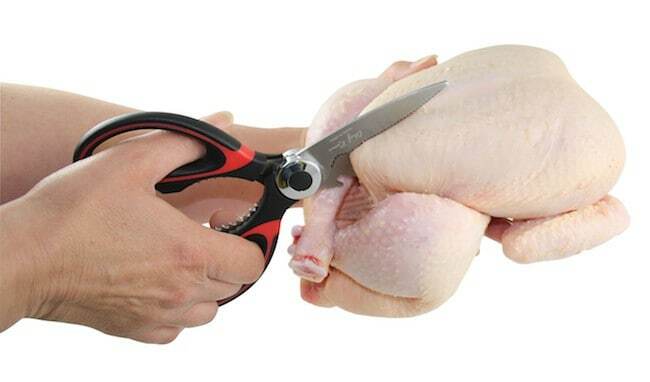 How do you know that you are purchasing the best poultry shears for your needs? Here’s a few things to look out for before you buy. Kitchen shears will often be used for messy tasks, where your hands will become slippery. 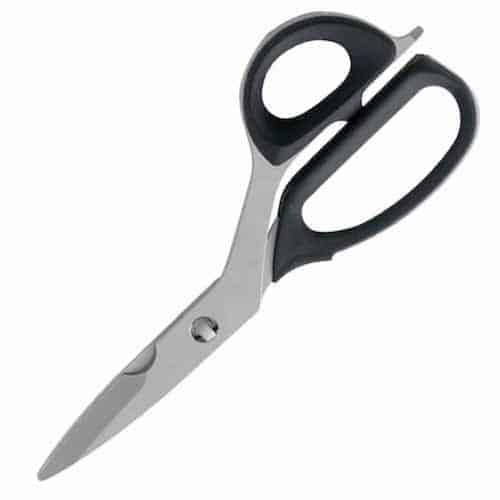 Therefore, the best shears will have a handle that provides a sure grip made from anti-slip materials. Polypropylene or silicone-coated handles are the ones to go for. Note the shape of the handles, both left and right handed users can pick these up. The shape of the handle will also help ensure a strong grip. What sort of hands do you have? Beyond overall comfort (which is subjective), the shears should be built so that the user can easily grip the handle from either side. An ambidextrous design in other words. Picture the following scenario. You’re in the kitchen with a slippery chicken in one hand, and you’re reaching over the work-top past all your ingredients for the poultry shears. (The dog is also barking at the post man, and your 2 year old has recently learnt to open the fridge). The last thing you need is a pair of kitchen scissors that require you to figure out which way around they work so that you can get your thumb in the ring hole. No, you want to grab those scissors to get the job done. Keeping the hectic kitchen scene in mind, once you’re holding your shears (and we’ve already established the grip is good), you will want to use them with minimum effort. That means the kitchen shears that only require you to apply force in one direction are preferable. For that, you should opt for higher quality shears that have springs built in to do the work for you. Built in springs can make life easier requiring less effort to use. Whether we are talking the tension of the in built springs, or the overall mechanism of the knife you will want the tension to be well balanced for your needs. The best kitchen scissors will not be too loose to open and close, (a flimsy set of shears will feel awkward to use and will not provide the control you need). Nor will the best poultry shears be too tight and difficult to use. To hit the middle sweet spot requires a tool of superior build quality that is well balanced, (may even have manual calibration facility) and is overall easy to pick up and use. Finally, another variable you can look out for when in the market for buying the best kitchen shears is blade length and overall blade edge retention. A good pair of kitchen scissors will have blades made from high-carbon stainless steel. This material has excellent edge retention while being easy to maintain. Another feature to look out for is micro serrations in the blade steel. These are designed to help anchor the blades to your ingredients. This aids the scissor action and helps the shears glide effortlessly without slipping and sliding off target. For those that didn’t realise, Kershaw are part of the same company behind the world famous Shun. The umbrella company is known as Kai, USA. And while Kershaw products are generally in the more budget friendly region compared to the output of the Shun factory, the fact the same expertise goes into the design of the Kershaw range of tools cannot be ignored. And believe us when we say that Taskmaster shears are an impressive pair of kitchen shears for the money. Made from high-carbon, cutlery-grade stainless steel you can feel the quality of the shears as soon as you pick them up. Like the Henckels (reviewed below), the Taskmaster shears are incredibly versatile. The designers have opted for a combined straight edge with a serrated edge product that make the shears perfect for all manner of uses. (The clue is in the name really – Taskmaster). A lid lifter pries under rolled metal lids to raise them quickly and easily, while its unique handle design helps grip the lids of tough-to-open jars. With more features than a small pocket knife the Taskmaster even has a built in bottle opener, nutcracker, and bone notch for grabbing game or poultry bones. The beauty of this tool, is the easy un-hinge mechanism to release the blades into two sections for maintenance. They are also dishwasher safe. Some larger handed users may find the plastic handles a little uncomfortable as they are smaller than average. Overall the Kershaw Taskmaster Multi-Purpose Shears are up there as the best kitchen shears for the money. In fact, the versatility of these shears make them equally suited to the hunter or fisherman as they are the home cook. The J.A Henckels kitchen shears make our list because of the excellent balance of affordability and quality that they provide. Henckels need no introduction for anyone even remotely interested in reliable kitchenware. The German based manufacturer has a superb reputation in this field. As you would expect, the attention to detail that the company is known for can be found in this excellent pair of kitchen shears. First off the corrosion resistant stainless steel structure features a micro-serrated blade edge for slip-proof cutting. Versatility is the name of the game here, and when it comes to multi-tasking the Henckels kitchen shears are in the higher division. The center area between handle and blade opens bottle caps, and serrated area in handle has been especially designed to be used as a nutcracker or screw cap opener. But what about the all important handle design and mechanism? Well the Henckels kitchen shears do punch above their weight. Despite the heavy duty and durable design, this is a well balanced tool that can be picked up by right or left handed users. 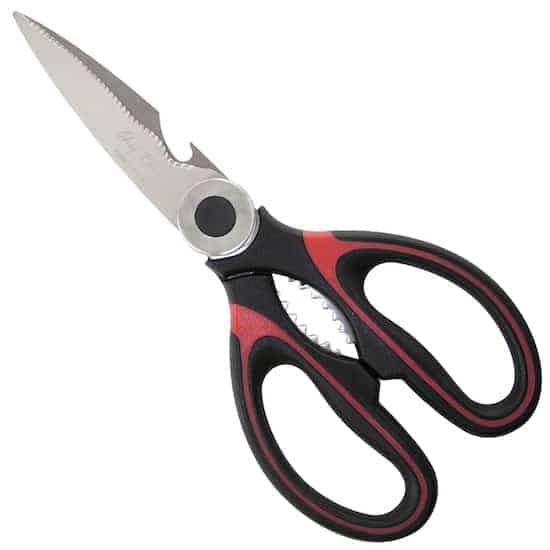 However, unlike other shears in our list, these do not come apart for easy maintenance and cleaning. Furthermore, although the shears are dishwasher safe, this is not recommended by J.A. Henckels International. The blade length is on the short side. They’re efficient cutters but some might prefer greater leverage. The best kitchen scissors you can buy? Maybe not, however J.A Henckels have still produced a top notch product here. Affordable, well built and easy to handle, these are definitely worth a look. Enter Wusthof, another German brand to make our top 5 best poultry shears list, with steel forged from the famous Solingen district of the country. The blades on the Wusthof 5558-1 are formed from high-carbon stainless steel and feature an impressive ergonomic design function – the metal actually curves inward so that the blade only meets in one place at any given position. The result is an extremely smooth and exact cutting process that requires very little effort on the part of the user. 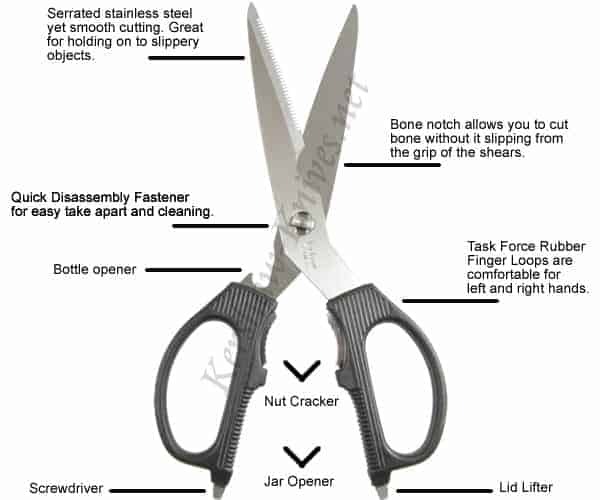 Furthermore, the handle shape and design ensures that the shears work equally well for right-handers and left-handers. 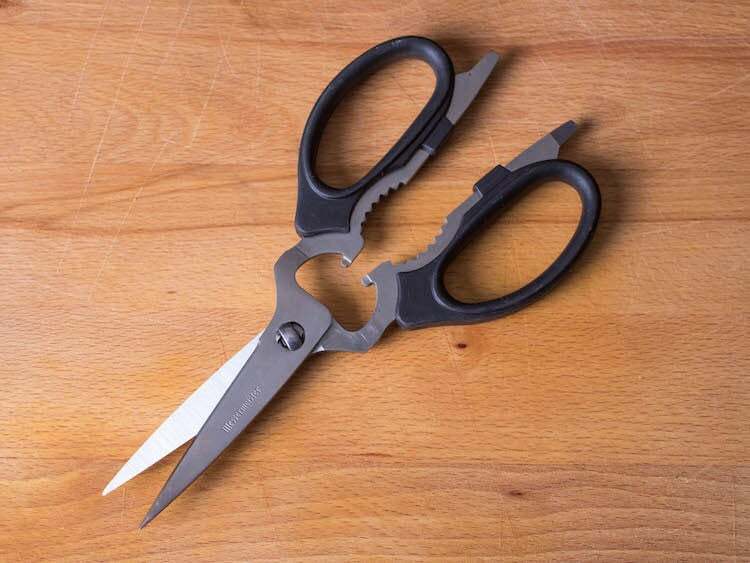 As the name suggest, these ‘come-Apart’ kitchen shears do just that, making them easy to maintain. The curved blade for minimum contact friction, and overall ease of operation. The symmetrical design meaning left-handers can use them as easily as right-handers. The ‘Come Apart’ mechanism is sometimes too easy to initiate, with some users complaining that the shears inadvertently separate when in use. Wusthof quality at the right price. While the 555-1’s do not tick all the boxes to make them the best kitchen scissors you should buy, they remain a reliable option. While reviewing the Kershaw shears above, we mentioned the fact both Shun and Kershaw are owned by the same company, Kai USA. And while we have given the Kershaw 5 stars out of 5, this is based on the fact the brand has delivered on both price and quality. So how has Shun done in comparison? First we have to comment on the build quality here. The fact is, the Shun Kitchen Shears are far and away above the other tools in our top 5. 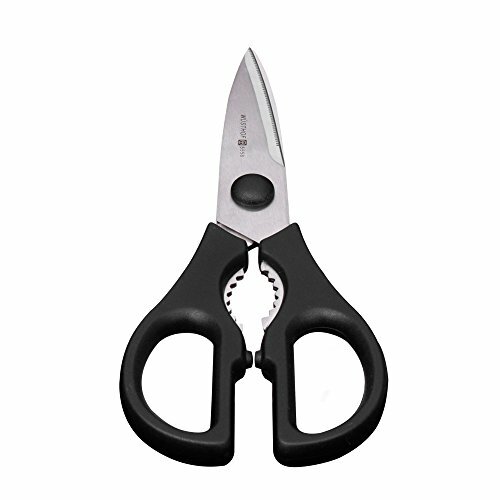 Where as the lower priced shears opt for plastic moulded handles, Shun use solid stainless steel handles with rubberised grips. 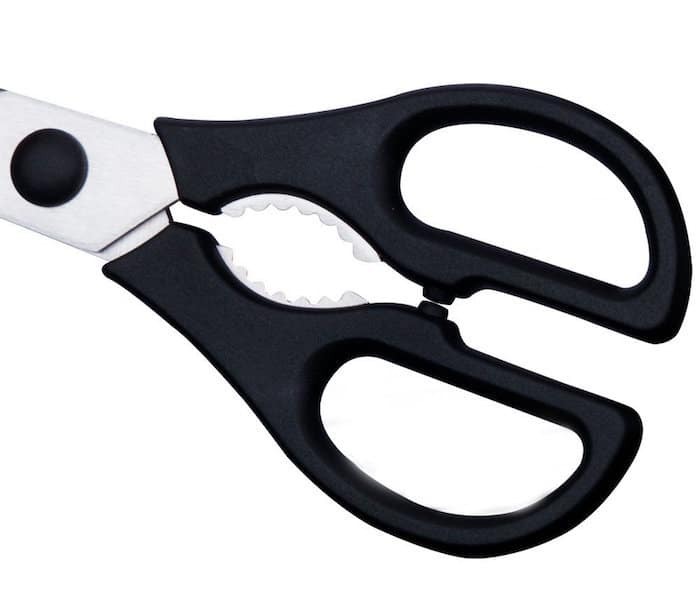 This makes for a very strong pair of shears, which are also comfortable and provide a slip free grip whether wet or dry. The exceptional build is ever present in the blades of course. Shun have gone for a high-carbon, molybdenum-vanadium stainless steel for strength, durability and excellent edge-retention. Again, this level of quality is not what you will find in any of the other shears in our top 5 list. Finally, the Shun kitchen shears come apart for easy maintenance. 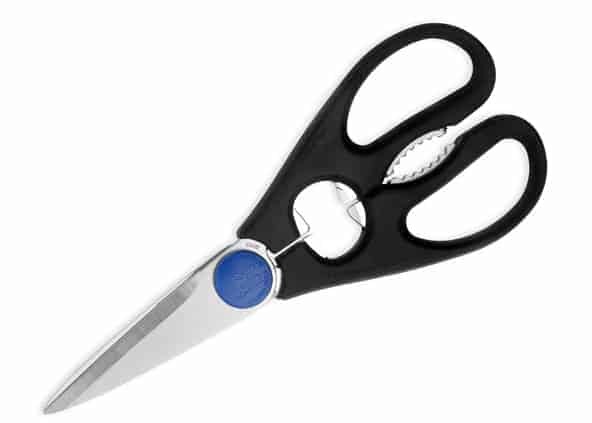 Which lets face it, if you’ve spent good money on a pair of scissors, you will want them to last. Being between 2 and 3 times more expensive that the other shears reviewed, some people will be priced out of the Shun shears. The build quality actually makes these quite heavy to use. Some users will love that extra weight and sturdiness; some however have found them cumbersome as a result. There’s no denying the fact that Shun have successfully set out to create the Rolls Royce of kitchen shears. The blades are extremely tough and sharp; the blade action is sublimely smooth – the tool oozes overall quality. If you do not mind the extra expense and can handle a pair of shears that feel weighty in the hand – Shun are currently the best kitchen shears you can buy. These Heavy Duty Kitchen Shears from Chef Remi are a bit of a curve ball as far as our reviews go. The fact is, we use Amazon for much of our research and obtain review models of the tools that we showcase form the various brands that use the online store as their marketplace. With this in mind, it is no surprise that Shun, Wusthof etc make our top 5 – these are reputable brands with quality products. With the Chef Remi however it is slightly different. As a minor player in the world of kitchenware, the brand is currently making great waves on Amazon with the release of their Heavy Duty Kitchen Shears. 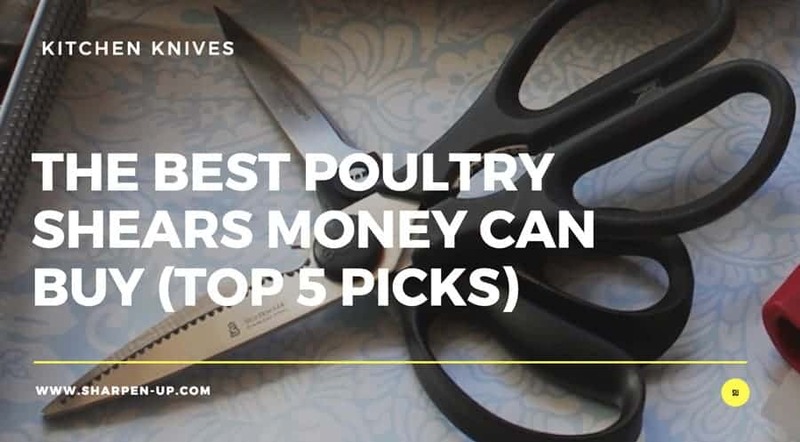 Well we can honestly state that the Chef Remi makes our top 5 best poultry shears list, because they are damn good while being extremely affordable too. 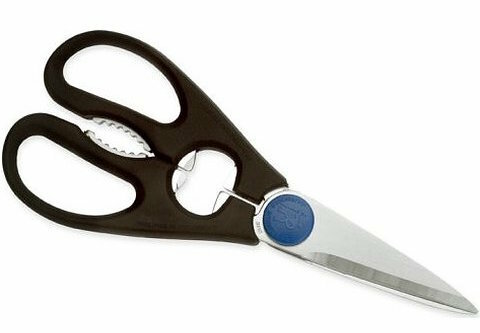 Despite the low cost the shears still feature Sharp stainless steel blades with micro-serrated edge for slip proof cutting. Versatility is good, with the serrated section in the handle making short work of opening tough sealed bottles or cracking nuts. 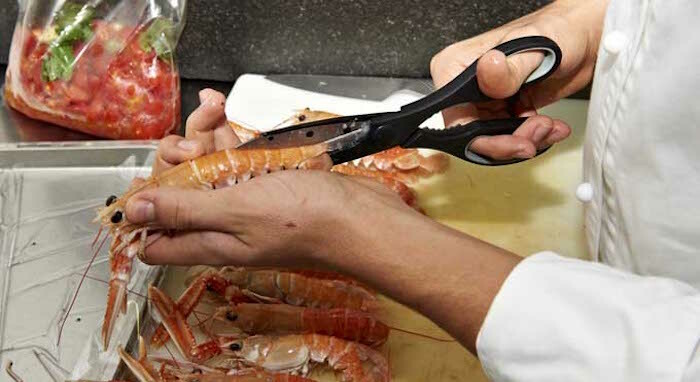 The shears can be used by both right and left handed chefs, and feature tough, high grip handles suitable for all conditions. To top it all off, the Chef Remi Multifunction Kitchen Shears comes with a 100% Money Back Lifetime Guarantee. Something even the big brands do not even offer. Despite the fact you may have never heard of them, and a large section of the Amazon reviews come from those that have received the shears in the post for free; the Chef Remis are a quality budget buy that will not disappoint. A surprise addition to our top 5 best poultry shears list, yet well deserved.